Thom is a pretty amazing basketball player and that's been the thing he's relied upon to make his father proud. His father is a loyal fan and Thom works extra hard on the court to be a hero in his eyes. But the truth is hard to hide and between the rumors floating around and some slip-ups at home, Thom isn't sure how much longer he can hide his sexual orientation from his father. As much as he wishes he could be honest with his Dad, he knows how much it would kill his father to know he was gay. But that isn't the only thing Thom is hiding. Thom's got superpowers. And Thom's got a real chance of joining the A-ist crime fighters of the League in their epic battles: Warrior Woman, the Spectrum, Golden Boy, and that amazing hunk Uberman (whom Thom's had a crush on for years). 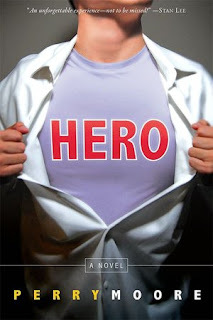 But Dad can't ever find out about Thom's dream -- Dad was once a superhero himself and was cast out in disgrace. Superheros aren't welcome in their home. What we get is an amazing mash of comic book worship, teen gay angst, and coming to terms. After all, nothing says homoerotica better than comic book superheros, does it? So, what Moore does is play on that to create a story that is both well-written pulp and serious teen gay novel -- a world where a young man who is both a potential superhero and gay has to prove he is not a freak. It's X-Men meets Edge of Seventeen. While that probably gives the novel a split personality, it's truly amazing how well it actually fits together. The last 100 pages or so of blood and guts action didn't do much for me, but they're integral to the nature of the piece. What really worked for me was the idea that coming out as a superhero or as a gay man could be equally heroic. And I think it worked for Moore as well. Kudos for something unique in LGBT lit!